Taye Ismaila Taiwo (born 16 April 1985) is a Nigerian professional footballer who plays as a defender for RoPS. After spending a year at Nigeria Division 1 club Gabros International, Taiwo was bought by Nigeria Premier League side, Lobi Stars. He spent one season at Lobi Stars. In 2005, at the age of 20, Taiwo was signed by French club, Olympique de Marseille. Taiwo was brought in to fill the void Bixente Lizarazu had left when he departed for Bayern Munich. The Nigerian left back scored Marseille's winning goal against Olympique Lyonnais on 21 March 2010, with a trademark left-footed strike from long range. He also scored Marseille's winning goal against US Boulogne on 17 April 2010. On 23 April 2011, Taiwo scored the only goal at the Stade de France against Montpellier HSC to win the 2011 Coupe de la Ligue. After the match, Taiwo grabbed a microphone and joined fans in singing an expletive-laden chant aimed at the club's rivals PSG, narrowly escaping a ban from the LFP. However, Taiwo received a one-match ban for his action, missing out on the last games of the season, which could have been his last match and since apologised. 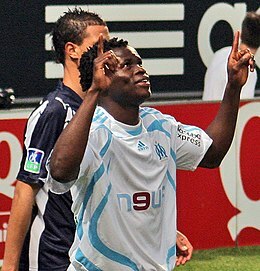 Though keen to sign a contract with the club, Taiwo announced that he would leave Marseille at the end of the 2010–11 season, to seek new challenge elsewhere. On 9 May 2011, A.C. Milan coach, Massimiliano Allegri, confirmed the signing of Taiwo along with French defender Philippe Mexès. The two were to play for Milan for the 2011–12 season. He made his debut with the club on 24 September 2011 in the home league match won 1–0 against Cesena where he was eventually replaced by Luca Antonini. In December 2011, Taiwo made an interview for the French sports newspaper L'Équipe where he said that he was disappointed with his current experience at A.C. Milan, commenting on problems with Massimiliano Allegri and on the fact that he wasn't playing. Despite the player spending much time on the substitutes bench, Taiwo iterated that he remained committed to the Italian club. On 24 January 2012, Queens Park Rangers secured the signing of Taiwo from A.C. Milan on a loan deal until the end of the season, with the option to buy for a fee of around £3.5 million. After making a move to QPR, Taiwo said he was expecting to make an impact at the club, rather than sitting on the bench. He made his debut on 1 February against Aston Villa in Birmingham, in a match which ended 2–2. After making two appearance at Queens Park Rangers so far, Taiwo claimed that he would stay at QPR. He scored his first goal for QPR through a fantastic executed curling effort from a free kick 27 yards out in a 3–1 defeat against Sunderland on 24 March 2012. On 31 July 2012, Taiwo joined Ukrainian club Dynamo Kyiv on a one-year loan deal with the option of making the move permanent at the end of the season. On 5 July 2013, Taiwo signed a three-year deal with Turkish side Bursaspor. He was linked with a move to the Premier League by joining newly promoted club Cardiff City, but opted to move to Turkey. On 1 August 2013, Taiwo scored on his Bursaspor debut, in a 2–2 draw Vojvodina in the first leg of their Europa League third qualifying round tie. On 27 April 2015, Taiwo mutually agreed to have his contract terminated with Bursaspor. Taiwo with RoPS in 2018. On 23 August 2015, Taiwo joined HJK for the remainder of the season with an option for a one additional year. In October of the same year, HJK exercised their option of keeping Taiwo under contract for the 2016 season. Taye Taiwo called time on his playing career with HJK after their final league game against SJK on 23 October 2016. On 30 January 2017, Taiwo signed for Lausanne until the end of the 2016/17 season. Taye Taiwo joined Allsvenskan side AFC Eskilstuna for the remainder of the season August 2017. In 2018, Taye Taiwo joined Veikkausliiga side Rovaniemen Palloseura for the season 2018. ^ Italy take note of Taye Taiwo. MTN. 16 September 2011. Retrieved 6 December 2011. ^ "Taye Taiwo elu joueur ICM du match". Coupe de le Ligue BKT (in French). 23 April 2011. Archived from the original on 26 May 2012. Retrieved 6 December 2011. ^ Taiwo facing ban for taking mic out of PSG. soccernet.espn.go.com (ESPN). Retrieved 6 December 2011. ^ "Taiwo banned for chant". Sky Sports. 16 May 2011. Retrieved 13 July 2013. ^ "Taiwo keen for new deal". Sky Sports. 15 October 2010. Retrieved 13 July 2013. ^ "Taiwo knows next destination". Sky Sports. 7 April 2011. Retrieved 13 July 2013. ^ AC Milan confirm deals for Philippe Mexes and Taye Taiwo. soccernet.espn.go.com (ESPN). Retrieved 6 December 2011. ^ "Calciomercato - Taiwo "rompe", il Milan è su Maxwell" [Football - Taiwo "breaks", Milan is on Maxwell] (in Italian). Yahoo! Sport. 12 December 2011. Archived from the original on 10 January 2012. ^ Taye Taiwo wants AC Milan stay. eyefootball.com. Retrieved 6 December 2011. ^ "QPR seal loan deal for Taiwo". ESPN Soccernet. 24 January 2012. ^ "Taye Taiwo targets immediate impact at QPR as loan move from AC Milan nears completion". Goal.com. 20 January 2012. Retrieved 13 July 2013. ^ Taiwo: "I tifosi del Milan non credono in me, resto al QPR"
^ "Sunderland A.F.C. 3 – 1 Queens Park Rangers". BBC Sport. 24 March 2012. ^ "A.C. Milan comunicato ufficiale" (in Italian). Associazione Calcio Milan. 31 July 2012. Retrieved 31 July 2012. ^ "Nigeria's Taye Taiwo seals Bursaspor switch from Milan". BBC Sport. 7 July 2013. Retrieved 13 July 2010. ^ "Taiwo snubbed Cardiff to join Bursaspor". Goal.com. 8 July 2013. Retrieved 13 July 2013. ^ "Vojvodina 2 – 6 Bursaspor". UEFA. 1 August 2013. Retrieved 2 August 2013. ^ "Kamuoyunun Dikkatine !" (in Turkish). Bursaspor. 27 April 2015. ^ "HJK SOPIMUKSEEN TAYE TAIWON KANSSA" (in Finnish). HJK. 23 August 2015. Retrieved 23 August 2015. ^ "Taye Taiwo extends HJK Helsinki contract". The Nation Nigeria. 21 October 2015. Retrieved 27 October 2015. ^ "TAIWO, DÄHNE JA ATOM JATKAVAT KLUBISSA" (in Finnish). Helsingin Jalkapalloklubi. 20 October 2015. Retrieved 20 October 2015. ^ "Taye Taiwo quits Finnish club HJK Helsinki". Goal.com. 24 October 2016. Retrieved 24 October 2016. ^ "TAYE TAIWO S'ENGAGE AVEC LE FC LAUSANNE-SPORT". lausanne-sport.ch (in French). Lausanne Sport. 30 January 2017. Retrieved 7 February 2017. ^ "Taye TAIWO". www.lfp.fr (in French). Ligue de Football Professionnel. Retrieved 10 February 2016. ^ "T.Taiwo". Soccerway. Retrieved 10 February 2016. ^ "Taye Taiwo". National Football Teams. Benjamin Strack-Zimmerman. Retrieved 10 February 2016. ^ "Glorious Ghana trounce Super Eagles". The Guardian. 7 February 2007. Retrieved 10 February 2016. ^ "Nigeria clinch Group Three". news.bbc.co.uk. BBC Sport. 19 June 2007. Retrieved 10 February 2016. ^ "Nigeria defeat sees Swiss end year with negative balance". espn.go.com. ESPN. 20 November 2007. Retrieved 10 February 2016. ^ "Siasia starts with a win for Super Eagles". www.kickoff.com. Kick Off. 9 February 2011. Retrieved 10 February 2016. This page was last edited on 17 March 2019, at 03:42 (UTC).